Republicans in DC and across the nation may be engaged in a collective game of chicken when it comes to crippling the economy but they seem dead set on permanently disabling the ability of middle class Americans to protect themselves against the most aggressive and predatory forces of Wall Street.Â Case in point, the nomination of Elizabeth Warren to head the Consumer Financial Protection Bureau (CFPB). Republicans have been gunning for Warren from the start, and the reason is simple.Â Her warnings of Wall Street excess and fraudulent, criminal conduct started well before the bubble burst in 2008.Â Plainspoken and tough as nails Warren is perhaps the most dangerous woman in Washington because she can speak truth to power in a way that resonates with Americans outside the DC beltway.Â Which is exactly why she has Republicans so scared. For those following the Warren saga, and it is a saga, the latest development is that Republicans found a way to block a possible Warren recess appointment by simply refusing to adjourn, thereby effectively “staying in session”.Â To be more precise, the narrative goes that the House (through Speaker Boehner) has the ability to keep the Senate in session by refusing to adjourn.Â It’s a narrative that’s gained traction, but the thing is, the narrative is wrong. Article II, section 3, clause 3 grants the President the authority to adjourn both the House and the Senate.Â So, if the Senate wants to adjourn, to say allow the President the opportunity to make recess appointments like Warren but the House won’t let it, the President can adjourn both houses to solve the dispute. So, Senator Reid and President Obama, how about it.Â There’s been a lot of teeth gnashing over Republican obstruction of executive appointments.Â While it may not be the most dignified way to get Warren appointed, this is Washington after all.Â Since when did dignity drive any decision? They can't keep the Pres. from naming her as a Recess Appointee. Good grief, GW got John Bolton that way, our nuttiest U.N. ambassador ever! Surely BHO can Recess someone who is not scared to stand up to the banksters? Warren should definitely get this appointment. She conceived of the idea for this bureau and she is highly qualified for the job. 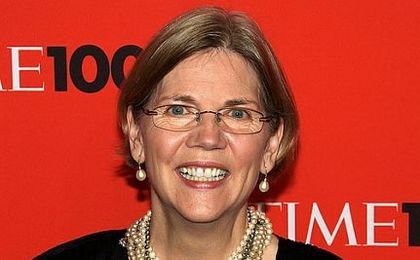 I have respected Elizabeth Warren since she first appeared on The Daily Show about 4 years ago. She predicted the Wall Street meltdown right then and there, down to the 't'. Supreme Court appointments are one of the most lasting effects on the country any President ever gets. Remember these judges are appointed FOR LIFE. Theeir decisions effect the way our country goes for decades! Obama has tried and tried to work WITH Republicans to no avail. They do not even try to do the right thing, they just block everything and anything he does. Obama would be foolish to try to work with Republicans on this. Our country needs voices of reason like hers. I am a stickler for due process but, as long as there is a legal loophole, Obama, appoint her! This one's for the survival of our country and the people in it, and the rest of the world as we effect it. Finally someone who care's about the American people. Finally someone on our side! Just thank you to Mildred D. for the green star!